If you’re looking for the highest amperage stun gun, then you’ve seen past the hype concerning voltage. When we first started selling stun guns back in 2000, the highest voltage stun gun at the time was a whopping 300,000 volts. Soon after, manufacturers started to increase the stated number of volts to be higher than the next guy. Amperage wasn’t even on the radar. We had 400,000 then 500,000 and even a 775,000 volt stun gun. It wasn’t long till the Million volter came out and it was all the rage. Back then, these devices worked on 9 volt batteries. Any reasonably common sense type person could deduce that the more batteries it took, the more powerful the output actually was. This was true no matter what the stated voltage was. If a device took 2 batteries and was 300K volts, it was more powerful than a million volt stunner that only took a single battery. Comparing them side by side was another way to tell the difference between them. You can tell how strong it is when you fire them off one after the other. Without knowing any specifications, your eyes and ears will tell you exactly which one you don’t want to be stunned with. So even after the 2nd and 3rd million volters came out, there wasn’t much difference in the actual output of any of them. While higher voltage means it has more penetrating power, the newer numbers coming out were more for marketing than any increase in actual take down power. Voltage as low as 25,000 is enough to go through clothing so higher amounts are not necessary anyway. Is it Volts or Amps? In any case, it’s the amps that provide the juice delivering the most energy rather than the voltage. Voltage gives it the push to go through clothing so the higher the real voltage, the better the ability to deliver the charge through thick jackets and such. Amperage is the biting force. And in the case of stun devices, we’re talking thousandths of an amp, measured as milliamps. You’ve heard the saying, “One amp will kill ya.” Well, we’re nowhere close to that when dealing with these self defense products. Most of them are between 3 and 4 milliamps. This amount is enough to deliver the effect you’re after. Anything close to or over 5 milliamps will overload the circuitry inside the device and burn out the capacitor. The capacitor is where the energy builds up and is stored till it’s discharged through the probes. Too many milliamps and you’ll burn out the unit. One of our strongest stun guns is the Runt. It has 4.5 milliamps which is more than enough to overload the electrical impulses of the human body. The body has nerves just about everywhere so anywhere you touch the person with the probes of the stunner is going to have an effect. However, if possible, you want to go for the major muscles groups such as the neck, upper body, or even groin area to have the best effect. The electronics inside the Runt are top quality and the thick electrodes (probes) on top deliver all available energy into your attacker. For being such a small weapon, it really does have it all when it comes to available power and having the desired effect of stopping an attacker. Nowadays, most stun guns use rechargeable batteries. This saves you from having to replace batteries but you do have to remember to plug your device in every 2-3 months. 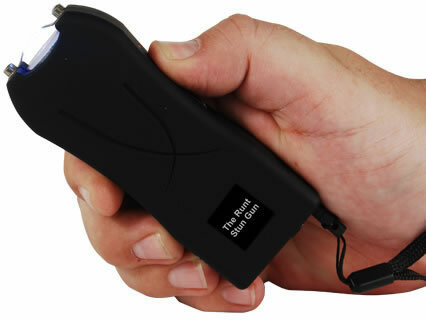 The stun gun is one of the most powerful and effective tools for self defense. Handy, simple in design and straightforward to use, stun guns are preferred in many instances for deferring an attack or controlling unruly and dangerous behavior because it delivers fast, efficient results. Stun guns come in a variety of power, usually expressed in voltages. The number indicated as the voltage of the stun gun is an indication of its power, but again, it's the amps that matter. Stun guns with high voltages are intended for close encounters. They are designed to shock by contracting the muscles and causing pain. However, they may not be effective in knocking the assailant to the ground. They are, however, quite efficient at producing shock that will cause enough pain and discomfort in order to discourage a physical attack. Just how powerful is stun gun voltage? If you’ve ever experienced the discomfort of static electricity, such as when you rub your shoes against a synthetic rug and proceed to touch a door knob, then you could safely say that you’ve been shocked with about 20,000 to 30,000 volts of electricity. This does not even compare to what a stunning device gives. And just what source are you using that states the voltage cannont exceed 30,000 volts when traveling between two prongs? Because I can't find the actual reference in the source given by Sabre. I imagine it's made up. Actually 30,000 volts is the maximum that can be sent between two prongs 1 centimeter apart. Any more voltage would be against the laws of physics. You should really advertise the Amperage because that is what does the damage. Thank you for, I hope, an unbiased opinion. I do not trust most reviews because they are pushed by the dollar signs, and the information you just gave sounds vert creditable. I do know the volts are a highly overrated number, and the amp number is much more important. Try getting that number. Thanks again. Check out more blog entries or shop our best sellers. Blog readers get 10% off! Use promo code: blog10 during check-out. Are Real Throwing Knives Legal and Where Can You Carry Them? Why is Pepper Spray a Great Option For Self Defense? Nanny Cam Laws: Is It Legal? Taser vs Stun Gun: What's the Difference and Which Should You Choose? How Do I Recharge my Runt Stun Gun? What Is Pepper Spray Made Of? Not a Business But Still Want to Make Extra Money? Are You Afraid to Carry a Stun Gun? Afraid To Go Outside Alone? Does a stun gun have to be fully charged to work? SAP Gloves - Are They Legal? Is a Self Defense Alarm Really Effective? Bear Spray Vs. Dogs: How Effective Is It? "The breadth of products offered is really helpful, purchasing through the site is easy, and communication is excellent. The site itself could use some updates for searches. If you don't word the..."
"Great quality product! It is exactly as advertised!" "5/5 While it took a few extra days to arrive, it came as expected. No damage to the package and product itself. Customer service email replied within a day after I asked if the package was sent..."
"5 stars my order was ship fast"
"Excellent product so far...purchased 2 as xmas gifts. Great size as well." "Site is easy to navigate with lots of different products for just about any self-defense needs you have. We've ordered from TBO-Tech multiple times and will continue to do so. Great customer..."
"I have purchased 5 of the previous version of the Stun Master Stun Baton (Telescopic) for myself/friends/family over the past several years from TBO-Tech and all 5 are still fully functioning like..."
"Very well made, very solid. Great quality. Worth the cost." "Seem very high quality..tight fit at largest size but im 6'6 "